A moment of bliss came over in a jiffy when one of my co-intern said that “I, she (Sanjiya) and Ajit need to handle the things around now." When this responsibility hit my ear drum, it really became music to my ears. General people praise us and tries to motivate us with high extent which make us feel that nothing is impossible for us to achieve anything we desire of. But, when it comes to performing a task, they seem very incredulous in our ability. They only think of our “dis-ability” rather than “this-ability” that we really possess. KATHMANDU, 15 August 2018 – In this fast paced technological era, the smart phones as well as the mobile apps have been evolving and is mostly used tools by everyone. Considering the age of mobile tech and mobile apps, them four enthusiastic youths, Bikash paneru, Lawa Gautum, Anamol Dhakal and Kush Gautum, worked as an intern in UN Information Centre Kathmandu (UNIC) as a mobile app developer. They made a great contribution in developing mobile app “UN in Nepal” which can be easily downloaded from Google play store. Their contribution in developing mobile app has helped users of digital library to get UN publication easily. KATHMANDU, 31 July 2018: "We didn't stop even in crisis"
When Nepal was in crisis of devastating earthquake on April 2015, Yaso Hangma Rai and Manisha Kumari, worked as an Intern in UNIC. Formal interns, shared their experiences working with UNIC in crisis. They didn't stop even in crisis. They contributed innovative idea of information sharing of earthquake status through UN digital library which made them confidence working for good cause preserving institutional knowledge. Their tenure in UN information centre and hard work helped them significantly, Yaso hangma Rai is working in SOS Bal Garm as scholarship assistance and Manisha kumari is in fellowship with an organization, Teach for Nepal. They shared about their work of UN Digital library and recommended all for public information of the UN in Nepal. KATHMANDU, 5 July 2018: Anjana Shrestha, who is currently pursuing master degree in development studies, shared her experience partaking in UNIC as an intern in 2014. She remarks an implication of UN Digital Library has benefited her in many ways throughout her journey of acquiring knowledge. Further, she recommended students, academician and developmental workers to use un.info.np to study about works of the UN in Nepal. UN Digital Library is also available in mobile application that can be installed from Google PlayStore, "UN in Nepal". Following list is detail of libraries in Kathmandu for your reference. “UN in Nepal” mobile application is connecting UN Digital Repository in Nepal (http://un.info.np) featured by UN Information Center, Nepal enhancing reach of digital library to public. The "UN in Nepal" application provides easy access to the UN publications and resources of UN agencies in Nepal through mobile phones and portable devices. Ask question, most relevant documents pop up at the top of search result. Research result, downloaded documents and UN news available offline. Search History with offline data. Your data protection with your own credential. Unlimited accessibility of UN documents through one window. Personal dashboard of mobile application. Non-governmental organizations (NGOs) have been partners of the Department of Public Information since its establishment in 1947. The official relationship between DPI and NGOs date back to 1968. Through NGOs efforts to disseminate information about issues on the UN’s agenda, DPI seeks to reach people around the world and help them better understand the work and aims of the United Nations. NGOs provide the United Nations with valuable links to civil society. They play a key role at major United Nations conferences and are indispensable partners for UN efforts at the country level. Model United Nations is a simulation of the United Nations General Assembly, Security Council, and other multilateral bodies. Students assume the roles of ambassadors and represent their assigned countries at Model UN conferences. The students resort to diplomacy and negotiation in order to find solutions for complex global issues such as the environment, economic development, refugees, AIDS, conflict resolution, disarmament and human rights. More than 400 conferences take place in 35 countries annually. Depending on the location, the average conference can have as few as 30 students or as many as 2,000. Unlike other mornings, interns at UN Information Centre Nepal seemed quite nervous at 26 May – the day they made self-evaluation presentations. Started with presenting own learning processes of Microsoft Excel, useful tool at the office, it soon became a forum for addressing their daily tasks and working updates. Even though they looked quite nervous at first, soon they started to make presentations proficiently. The United Nations Information Centre (UNIC) is the principal source of information about the United Nations system in Nepal since 1964. The information centre is responsible for promoting public understanding and support for the aims and activities of the United Nations by disseminating UN information materials to a local audience in English, Nepali and other languages utilised in the region; engaging local and regional partners; and, overall, bringing the United Nations closer to the people it serves. Offsetting complexity of accessing digital public documents of the UN has been facilitated by initiation of UN mobile application, which puts most relevant document at the top of search result according to queries of end user. The effectiveness of mobile application in enhancing the search of UN public documents, where more than 40% of the population of Nepal has access to the Internet and especially in youth, uses of the Internet in mobile is prominent way for information accessing and sharing in Nepal. KATHMANDU, Thursday, 18 June 2015 – The United Nations Information Center launched the UN digital library known as UN Digital Repository in Nepal (UNDRN) in Tribhuvan University Central Library. 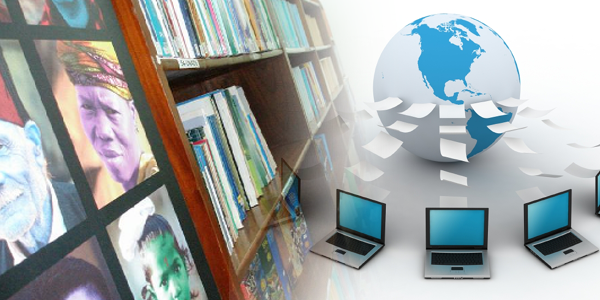 The aim of UN digital library is to provide one window easy access to documents and publications published by the UN agencies since 1951 about Nepal to students, academicians and scholars. The digital repository is accessible by www.un.info.np. In the wake of the recent devastating earthquake, Nepal has lost a lot—lives, culture, historic monuments; the list goes on. The 7.6 magnitude quake and its numerous aftershocks have also destroyed many of the Capital’s libraries: many that house antique manuscripts dating back 200 years. As the monsoon approaches, it is going to be a challenge to preserve these invaluable pieces of history. The United Nations became operational in Nepal over half a century ago, when the Food and Agriculture Organization opened its office in 1951. Since then, an additional 23 UN agencies, funds and programmes have opened offices, the latest being the UN Office of Disarmament Affairs which opened its Regional Centre for Peace & Disarmament in August 2008. The World Bank, the Asian Development Bank and the International Monetary Fund also have missions in Nepal and participate in the UNCT. The UNCT is an important development partner in Nepal. It is committed to ensure development results that bring positive change in Nepali people’s life. The UNCT’s common objective is to deliver coherent, effective and efficient support to Nepal in achieving the Millennium Development Goals and other national and internationally agreed goals. The UN’s work in Nepal aims to ensure programme excellence, good practice and compliance to global policies. About 2155 (1859 national and 296 international) dedicated UN staff members provide their expertise and services in support of achieving the UNCT’s objectives. The UNCT (excluding the IFIs) mobilized approximately USD 206 million in development and humanitarian assistance in 2011 and expects to spend about USD 259 million in 2012. Young and enthusiastic interns in the United Nations have contributed to develop meta-data of thousands of UN publications storing UN Digital Repository in Nepal. Their immense efforts are counted for good causes in history of initiation of the repository. The interns work for the generation of metadata; they essentially feed or upload reports, publications, posters, press releases and other official manuscripts of the UN in Nepal to the database. The goal is to achieve 10 K documents by the release date. Other interns are involved in promotion packaging, article writing, reference library management and the ICT engineering aspect of the venture. The team is composed of energetic youths from various backgrounds such as engineering, social work, literature and journalism. The internship has high female participation. “The United Nations cannot achieve the purposes for which it has been created unless the peoples of the world are fully informed of its aims and activities. In order to insure that peoples in all parts of the world receive as full information as possible about the United Nations, the Department of Public Information should consider the establishment of branch offices at the earliest practicable date.” [A/Res/13(I), Annex.]. This statement is as valid today as it was in 1946 when the General Assembly set out the terms of reference for the activities of the Department of Global Communications (DGC). The first nine United Nations Information Centres (UNICs) were established in 1946-1947 [JIU/REP/79/10]. Today, the network of 63 United Nations information centres (UNICs), services (UNIS) and offices (UNOs) link the UN Headquarters with people around the world. How to become an intern at UN Information Centre? Welcome to the website of the United Nations Information Centre (UNIC) Internship Programme. This Internship Programme is for UNIC in Kathmandu only. Eligible students interested in participating in an internship at UNIC can apply by visiting the United Nations Digital Repository in Nepal, at http://un.info.np. Please continue to read through our website for more information and guidelines. The use of this web site constitutes agreement with the following terms and conditions: (a) The United Nations maintains this web site (the “Site”) as a courtesy to those who may choose to access the Site (“Users”). The information presented herein is for informative purposes only. The United Nations grants permission to Users to visit the Site and to download and copy the information, documents and materials (collectively, “Materials”) from the Site for the User’s personal, non-commercial use, without any right to resell or redistribute them or to compile or create derivative works therefrom, subject to the terms and conditions outlined below, and also subject to more specific restrictions that may apply to specific Material within this Site. All UN agencies including programmes and projects in Nepal are stakeholders of the UN Repository in Nepal. Contribution of many interns and volunteers has been incorporated to build the UN Repository. Students from universities and colleges are encouraged to apply for internship in UNIC, Nepal. Media outreach is essential to successfully fulfilling the United Nations information centre’s core function of communicating information about the work of the United Nations to governments, civil society and the world at large. UN Digital Repository in Nepal (UNDRN) is campaign for preserving institutional memorory through electronics media. Web Service provide open data servie to build on platform independed applications for any device, platform and web services. Dating back to 20th November 2014, my journey in the United Nations (UN) started. I am an intern at the United Nation’s Information Center and a third year student of Bachelors of Art in English Literature and Social Work at Kathmandu Model College (KMC). I was first informed about the “Knowledge Management Program” at UNIC by my college’s coordinator and three of us from KMC appeared for the interview. I am Anjana Sharma, a Bachelor’s in Arts in Social Work student. After joining the bachelors in social work I was precautious about the field visit and the internship but my happiness got amplified the very moment when I was informed about my selection in United Nations for the internship. I was encircled with thrilling pleasure and bit nervousness- a nervousness to engage in a new environment with new people. However there was nothing to worry about. I took off from my room on bike on 20th November, 2013 to participate and represent Himalaya College of Engineering in the internship oppurtunity at UN Information Centre, Pulchwok, Nepal. My transit was at my college. Every disaster is a transition. Every day of our life is a certain transition from one state to another, after which we change a little bit. For me, this experience was transition to a world full of responsibilities for myself, my family, my college, my country and the whole world. My name is Bindu Poudel. I am a Bachelor level student. Everyone can agree that I am a good student and that I like to study. My favourite subjects are Accounts and Marketing. I am going to enter the Tribhuwan University because my goal is to study these subjects in the future and to become a respected professional in one of the said fields.